Full size images of the awesome illustrations in Eric Says Thanks to use on big screens. Together with the story book these images allow you to read the story while showing the pictures on a large screen so that everyone can see them. 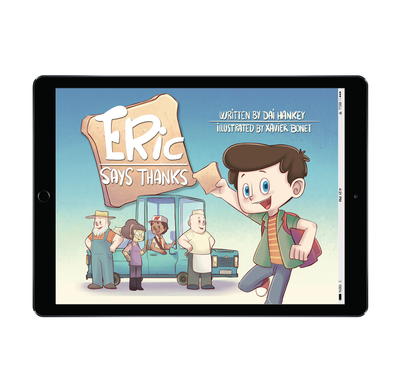 Eric says thanks is the tale of Eric who is so delighted by his tasty toast that he embarks upon an epic adventure of gratitude that takes him all the way to the giver of all good gifts! A great way to teach children about gratitude.